We love that when everything collapses and civic order is threatened, when the horror of the unexplainable arrives at the front door unbidden, and when all seems like tragedy in 360 degrees of vision, there are those men who take deep breaths, nod grimly, and in a deep, gravelly voice intone: "Someone fire up the grill, because we are going to need some hamburgers." Old country dudes in crisis situations are so beyond necessary it's not even funny. 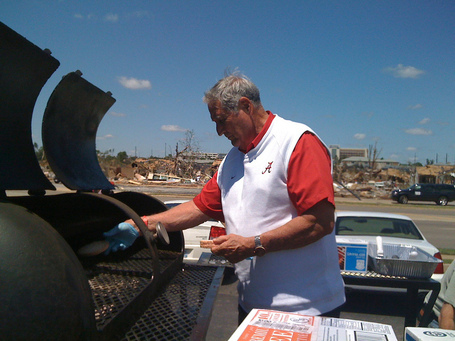 I have no love at all for Bama football, but Gene Stallings always seemed like a truly good and decent man. Old country dudes in crisis situations are so beyond necessary it's not even funny.